Acquisition History: Dunshee Island was donated to the Department by Leslie S. Hubbard in 1986. The Department renamed the property Great Island WMA. 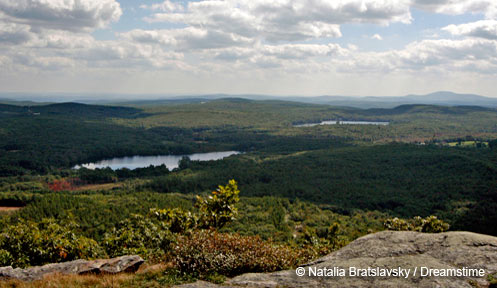 Description: Great Island WMA has been designated an exemplary rich mesic forest natural community by the New Hampshire Natural Heritage Bureau. Rich mesic forests are enriched hardwood forests growing on soils with relatively high levels of moisture, mineral nutrients, and high-quality organic matter. These forests grow at a faster rate than other forest types and may have about twice as many species of herbs and shrubs. The dominant tree is usually sugar maple, often accompanied by white ash and basswood. Common Wildlife: The small acreage and isolated nature of this parcel limit the majority of wildlife species to birds and insects though some small mammals may be common here. Bald eagles may use the island to roost. Special Notes: Overnight camping is prohibited. Directions: Great Island WMA can only be reached by boat. The Fish and Game’s Hubbard Farms cartop boat access is approximately 1.5 miles upstream.